Holy. Cow. I am totally serious now. These shortbread are literally insanely good; they might even be the best cookies I've ever made. If my ankle wasn't hurt, I would be jumping up and down, screaming about how amazing these are. AHHHHH I just want to gobble up the entire batch. I just want to make them every day. If it makes you feel any better, I did use some whole wheat flour and some oat flour. That makes them healthy, right? We'll go with that. And dark brown sugar=less processing. Even better for me. So really these are health food. Ok, maybe I'm a bit delusional, but who cares? They improve my mental health. 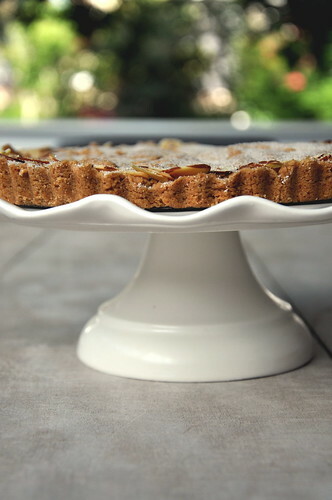 The multiple flours help to bring out the nuttiness, enhancing the almond flavor. The oat and whole wheat flours also make the cookies more tender, almost like cookie dough. The dark brown sugar makes the shortbread intense and complex, allowing a molasses flavor to shine through and make these even more addictive. These shortbread started out as a simple wheatmeal shortbread from Martha Stewart's Baking Handbook; however lack of ingredients and my self-indulgent imagination transformed them into something even better. 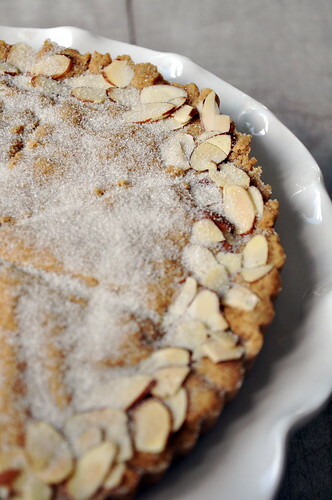 I added the little sliced almonds to the border to dress them up and also to hint at what was inside. My internship has really helped me to experiment and play with recipes, altering them to suit my tastes, making them even more appealing in my opinion. If you have enjoyed any of the other recipes I've shared with you in the past, you really, really, really must try these. They are my new favorites. Preheat the oven to 350 degrees. Cream together the butter and brown sugar in a stand mixer until light and fluffy. Add the almond extract and beat to combine. Whisk the flours and salt together in a medium bowl. Add to the butter mixture and beat until the dough is thoroughly combined. Press the dough into a 10-inch tart pan with a removable bottom or springform pan. 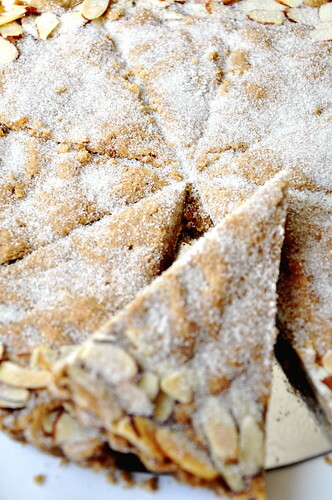 Press sliced almonds around the border or sprinkle over top. Bake for 30 minutes or until the edges just begin to brown. 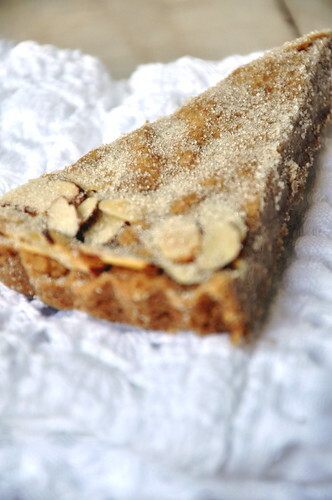 Remove from oven and score the shortbread into 8 slices. Return to oven and bake for another 15 minutes. Remove from oven and sprinkle with granulated sugar. Cool completely, and enjoy!